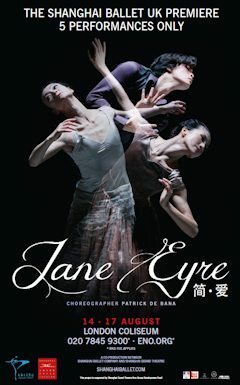 Shanghai Ballet Company is to make its highly anticipated UK debut in August at the London Coliseum with performances of JANE EYRE, an original, innovative ballet production based on Charlotte Brontë’s famous novel. In a bold re-interpretation, choreographer Patrick de Bana’s production puts the character of Bertha Mason, Edward Rochester’s ‘mad’ wife, famously locked up in the attic for most of the novel, firmly centre stage along with her two-timing husband and the novel’s heroine, Jane Eyre. With strong performances from the three lead characters – Ji Pingping (Jane), Wu Husheng (Rochester), Fan Xiaofeng (Bertha), gigantic, atmospheric sets and lighting, dramatic choreography and an eye-catching costume design that cleverly melds Victorian costume with the 21st century, JANE EYRE is a true break from tradition and sets Shanghai Ballet Company on a bold trajectory towards their London debut. Xan Lili discussed the idea with Shanghai Grand Theater and with Yu Rongjun, and gradually gathered together the creative team – including celebrated choreographer Patrick de Bana, writer Yu Rongjun, and set/costume designer Jérôme Kaplan – to discuss the plot, design and casting before getting the production underway. WU Husheng – Edward Rochester Wu joined Shanghai Ballet after graduating from the Shanghai Dance School in 2003; he has danced in Swan Lake, La Sylphide, Coppelia, Romeo & Juliet, Giselle, The White-haired Girl, The Butterfly Lovers, and modern pieces Conversation with Chopin, Web5, The Song of the Mother and more. His many awards include silver at the 9th New York International Ballet Competition, gold at the 4th Shanghai International Ballet Competition, and Shanghai Dance Association’s Outstanding Young Dancer award in 2011. FAN Xiaofeng – Bertha Mason FAN graduated from Shanghai Dance School and joined Shanghai Ballet; her main roles include Swan Lake, Coppelia, Giselle, La Sylphide, Romeo & Juliet, Don Quixote, Grand pas Classique, and modern pieces such as Red Fan, The Horizon and more. She has also performed with Australia National Ballet as guest principal. Awards include silver at the 1st Shanghai International Ballet Competition in 1995; gold at the 19th Varna International Ballet Competition in Bulgaria in 2000, and the 2012 Shanghai Literature and Arts Award. Patrick de Bana – choreographer Patrick is a graduate of Hamburg Ballet School; he has performed with Bejart Ballet, Compania Nacional de Danza of Spain and formed his own company, Nafas Dance in 2003. He has worked extensively in the worlds of tango, fado and flamenco; he has choreographed many ballets including Cléopâtre – Ida Rubinstein for Andris Liepa’s Les Saisons Russes which performs at the London Coliseum in July 2013. Jérôme Kaplan – set and costume design Jérôme was born in Paris and has designed sets and costumes for numerous ballets including L’enfant et les Sortilèges, Roméo et Juliette, Cendrillon (Cinderella), Casse-Noisette Circus, and in 2009 Scheherazade for Les Ballets de Monte Carlo. He created costumes for Raise the Red Lantern staged by director Zhang Yimou for the National Ballet of China in Beijing; The Prince of the Pagodas for Strasbourg Opera and In the Mood for Love for Shanghai Ballet. He has worked with ballet and opera companies in Korea, Finland, Stockholm, Moscow, Amsterdam and the UK. Nick RONG Rongjun YU – librettist Nick Yu is a professional playwright and deputy general manager of the Shanghai Dramatic Arts Center. He has written more than 40 works for stage and screen and was attached to the Royal Court Theatre in London in 2008. His plays have been presented in English, Turkish, Japanese and in many countries around the world. Since 2005 he has also been chief director of the Shanghai International Contemporary Theatre Festival. Shanghai Ballet Company (director XIN Lili) was founded in 1966 and gained its current name in 1979. The company is part of the Shanghai Grand Theatre Group and performs a blend of traditional and Western dance styles. One of their best known works is The White-haired Girl which won the Gold Medal of the Best Classical Dance Works of the 20th Century in China which helped established the company’s predominant position in China’s ballet world. Since then Shanghai Ballet have created and staged numerous productions and have won an impressive haul of medals for its young dancers. The company actively participates in cultural exchange with artists and companies throughout China and abroad and is looking forward to its UK debut in August. Les Saisons Russes du XXIe Siecle, returning to London in 2013.